Town employees at the Neighbors Helping Neighbors event at their family members pick up litter at the top of Memory Park. Photo by Jennifer Jean Miller. 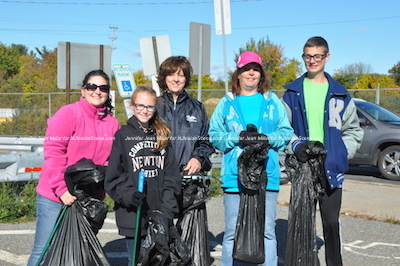 NEWTON, NJ – The chilly temperatures did not ice up the spirits and hearts of volunteers who donated their time to the fifth annual Neighbors Helping Neighbors Community Service Clean-Up event on Saturday, Oct. 17. The helping hands, as they have in past years, kicked off their day early in the morning at Newton’s Municipal Building with a continental breakfast, while grabbing their assignments for the morning. At the end of the time, the hardworking workers enjoyed a pizza lunch. Their tasks for the day have varied from leaf raking to picking up litter to planting to painting. The first 100 participants received a special t-shirt for their participation. Each one of them was equipped with gloves, rakes, litter sticks, garbage bags and other items to help them along with their duties. The teams headed out to various parts throughout town to help clean up. One of the volunteers choosing a piece of pizza. Photo by Jennifer Jean Miller. Additionally, a paper-shredding truck was at the town’s recycling center, where residents could deliver their personal documents for secure shredding. 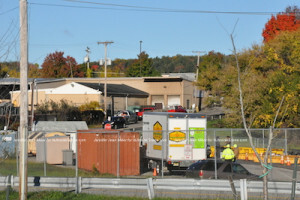 The shredding truck at the town’s recycling center, as part of a complimentary service for town residents that day to bring their personal documents. Photo by Jennifer Jean Miller. The Newton Shade Tree Commission planted a tree in conjunction with Arbor Day at Memory Park. 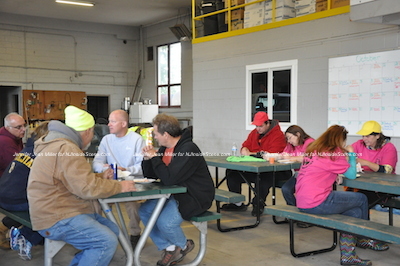 At the conclusion of the event, volunteers relaxed in the DPW garage in Memory Park to enjoy pizza, soda and camaraderie. “This is an event that encompasses everyone able to come together as a community and help others within the boundaries of the Town of Newton,” said Newton Mayor Dan Flynn, who also rolled up his sleeves to volunteer his time this morning. 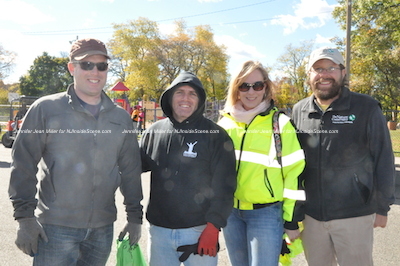 Mayor Dan Flynn (far left) poses with others who volunteered their time, including (from left to right) Anwar Quarmout, Recreation Supervisor Debbie Danielson, and Eric Olsen. Photo by Jennifer Jean Miller. 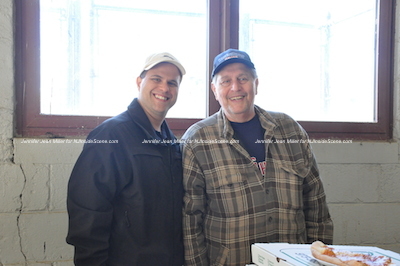 Thomas S. Russo, Jr. Town of Newton Town Manager also participated in the day, along with his father who volunteers his time annually too, and they did a range of tasks together, including dishing out pizza slices. The Russos stop for a picture while the two donated their time as a father and son team serving up pizza. Photo by Jennifer Jean Miller. Some of the individuals volunteering were from Christ Community Church, a co-sponsor of the event. Local girl scout troops were also involved. 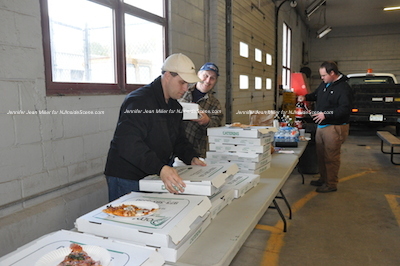 Volunteers for the clean up event enjoyed a pizza luncheon at the end of the morning. Photo by Jennifer Jean Miller. Russo said that normally when this event takes place it is in the spring, with plantings among one of the major “to-do” items on the list. In the fall, leaf raking and fall-related chores, especially recycling and cleanup, took place this round. He gave a special thanks to the DPW, which worked alongside the group assisting with the efforts. “Everyone gets along nicely and we all work together,” Russo concluded. Like the story you’ve read here? Then stay on the scene with Inside Scene. Click here to follow NJ Inside Scene on Facebook.